The "man in the felt hat" was 54-year old George Robertson, vice-president and manager of the new Roosevelt Raceway in Westbury. Robertson was the winner of the 1908 Vanderbilt Cup Race in the "Old 16" Locomobile and participated in the 1905 American Elimination Trial driving a Christie. The photo was taken on the track of Roosevelt Raceway, which was still under construction. The likely date was June 12, 1936, the official press "ground-breaking" day for the track which promoted the 1936 Vanderbilt Cup Race. Bonus: Identify the manufacturer of the racer and two drivers seen below. Still a mystery! The logo on the racer reads "Lau Motors Special." There was no Lau Motors Special in the 1936 race. Hugh suggests information on the racer below. Congrats to Frank Femenias and Greg O. for identifying George Robertson. 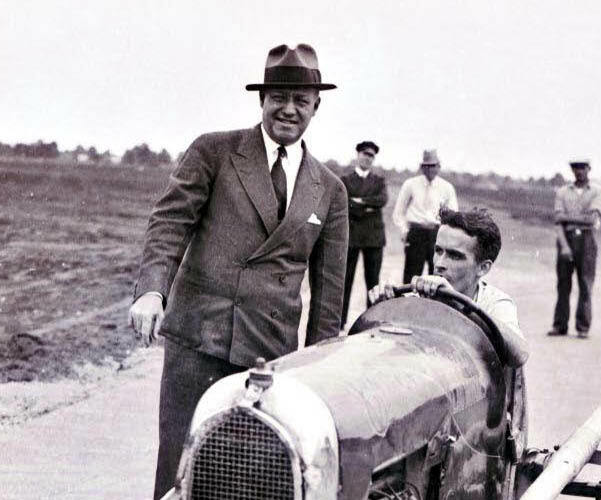 Just a guess, but is that Eddie Rickenbacker in the felt hat? I believe that he must have competed in a Vanderbilt Cup race during his pre-war (WW I) days. I have no idea about this event and who the drivers are, but if I was guessing and if it is in fact Rickenbacker then it might be an event associated with the Indianapolis 500. 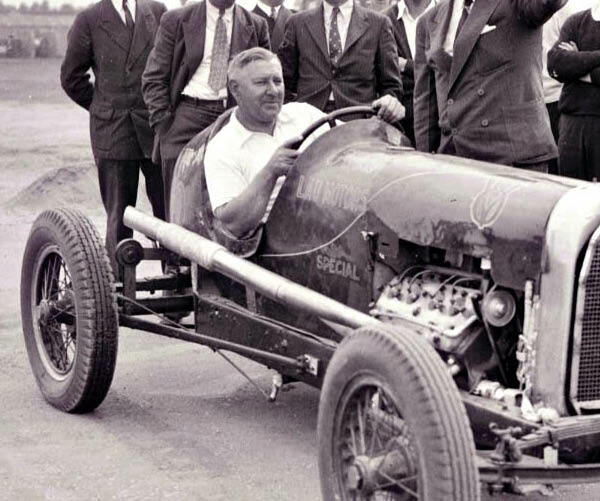 The racing car looks somewhat like a Miller, but the flathead engine doesn’t look right with a Miller. I ‘m guessing that these are Duponts. I can only comment on the construction. It was likely a 4 banger car built about 1930. The front axel is from a Model A less brakes. The rear axel is likely from a 1926 or 27 Model T [however late 1920s Chevrolet axels were also popular] The engine is a Ford V8 flathead as built from 1932 to 1936. Most likely the photo is from the 1938 to 1941 era. The body is nice enough to a factory built like Morton Brett. The radiator shell could be a narrowed Auburn or Chrysler from the mid 1920s. Like most good race cars, the better ones ran for many years and were modified and up-graded. Some even were run at hill climbs and in road races. Didn’t have time this weekend to research this one, but to throw out something if I can’t get to it tomorrow, I,d say that looks like George Robertson in the felt hat sometime in the mid to late 1930s. Laurel was a speed equipment company that built OHV heads for Model T Ford engines circa 1930. Morton Brett offered a radiator much like the one on this car. Lau Motors was a dealership located in Brooklyn during this time period - might it be connected to the car in the photo? Especially if it was a press event? It appears that above the word “SPECIAL” on the side of the car is someone’s signature, as in the “John Doe” Special, also note the V8 logo on the hood. Yes, there was a LAU MOTORS located in Brooklyn in 1937 (the earliest date I could find), which would become a Nash dealership located in Freeport “Nash LAU Motors”. See http://Nashparts.com/dealership/nashdealersny.htm for a great listing of NYS Nash dealers through time. The Nassau Daily Review-Star (Weds., 10/24/1945, p. 2) reported that Joseph A. Lau took over the former Columbian Bronze building at 14 Brooklyn Ave., north of LIRR, Freeport, for the Nash Lau Motors agency. Lau was a resident of Floral Park, and had an agency in Brooklyn until August 1942 when auto production was halted due to WWII. He was listed as being experienced in the auto business since 1921. Man! I was really wrong!! Model T race cars like this did run at Indy in 1924. Al Moss, father of Sterling drove one. They were in a class known as big cars, not midgets. In a way they were the beginning of the ‘kit’ car industry. 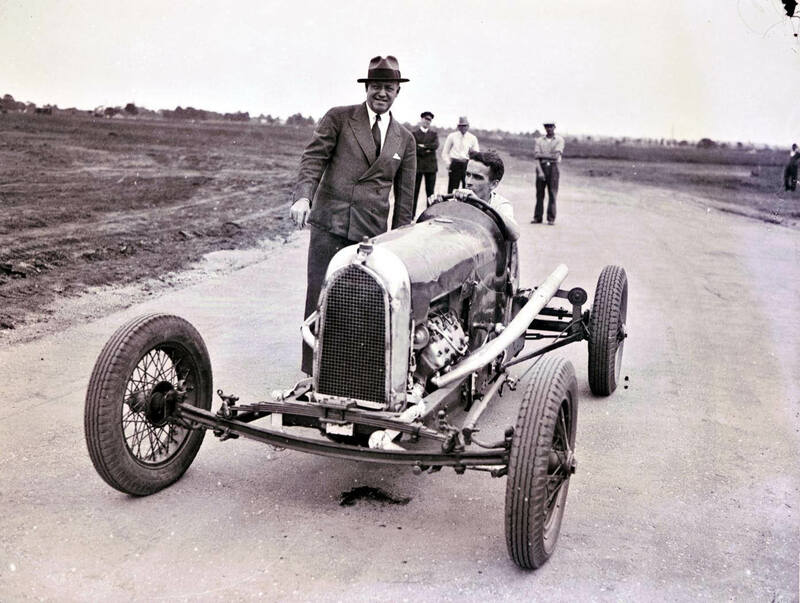 Many were built as speedsters and never raced. There is an interesting web-site N.W. 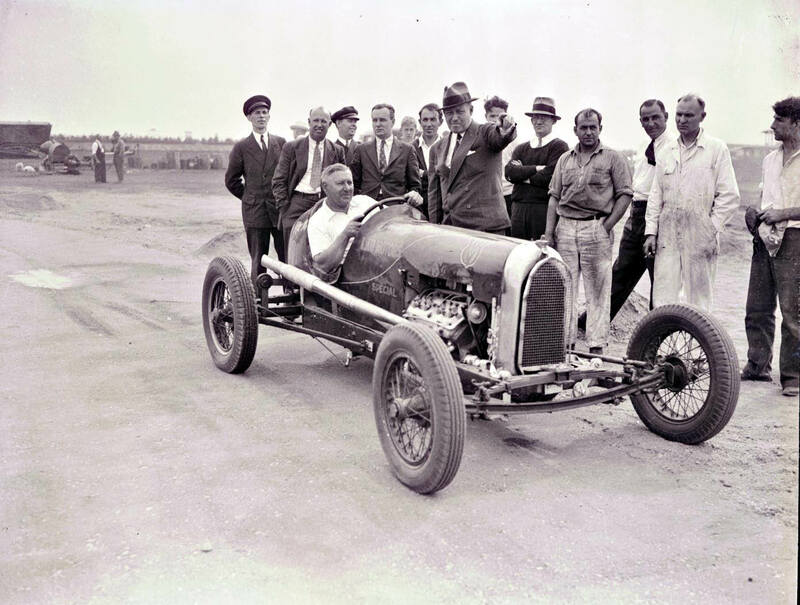 Vintage Speedsters that has lots of photos and a link to the Smith’s Speedway Museum in Lincoln NE. Many people involved in the engineering of these cars go back to the Vanderbilt days.